Any long-time reader of this newsletter knows there are several, often contradictory, sources for employment data. We have long relied on the Bureau of Labor Statistics' Local Area Unemployment Statistics (LAUS) report for labor force, employment, unemployment and unemployment rates at the metro level. Using this seasonally adjusted data, we see a very flat unemployment rate picture for the Kansas City area in recent months. The region’s unemployment rate has hovered near 7 percent throughout 2012. A flat unemployment rate would be fine if we were seeing growth in both labor force and employment. Unfortunately, the area's labor force has dropped by more than 15,000 since January, while employment declined by 9,000. On the bright side, the regional unemployment rate is more than a percentage point lower than the national rate (7.1 to 8.3 percent). 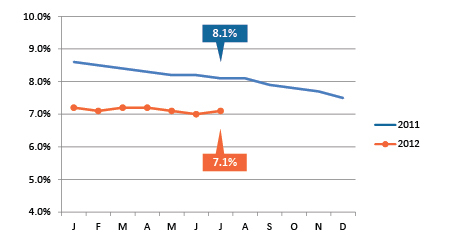 Help wanted ads continue to be the most promising workforce-related variable we are tracking. 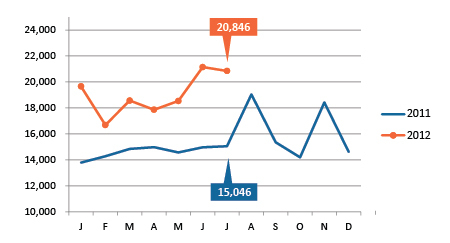 Job posting activity remains well above 2011 levels, with nearly 21,000 postings in July. After a slight increase in June, seasonally adjusted employment declined by 1,645 in July. 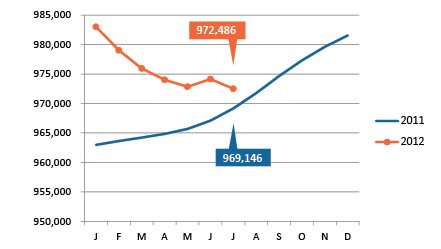 Overall, employment is up by just 3,340 from one year ago. Using seasonally adjusted data, the labor force has declined steadily throughout 2012, although the decline has leveled off slightly in recent months. Kansas City's seasonally adjusted unemployment rate has continued to hover right around 7 percent since the beginning of the year. With a 7.1 percent unemployment rate, the Kansas City metro ranks just about in the middle of its peers. Job postings remained considerably higher than this time last year, with nearly 21,000 help-wanted ads posted in July 2012. Where have our scientists gone? In a recent blog on KCEconomy.com , author Jeff Pinkerton, senior researcher at the Mid-America Regional Council, looks at the new data available from the Census Bureau’s American Community Survey that allows us to drill down a bit into education data and find out what fields of study are most common for those with bachelor’s degrees. Overall, 32 percent of area residents aged 25 and over have at least a bachelor’s degree. Nationally, only 28 percent do. 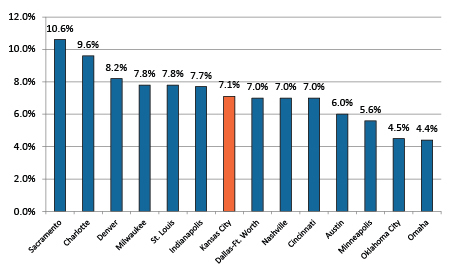 There were some surprising differences between the Kansas City region and the nation. Nationwide, 35 percent of all bachelor’s degrees are in the Science and Engineering fields (which includes the social sciences, physical sciences, math and computer degrees). In Kansas City, it’s just 29 percent. Kansas City has slightly higher percentages in the other categories. Read the full article at KCEconomy.com.